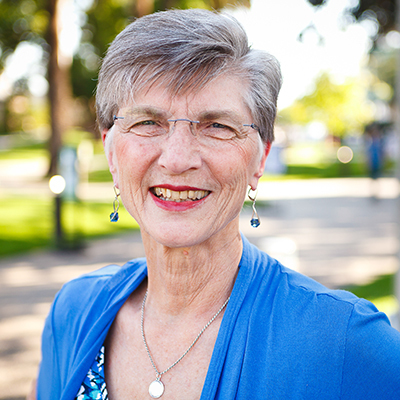 Elizabeth Glanville has been a member of the School of Intercultural Studies faculty since 2001 and is currently core faculty for the cohort-based Doctorate of Missiology program. From 2001 to 2009 she was director of the doctoral studies department for SIS. Before serving at Fuller, Glanville was director of a training center for families who were home schooling their children. She also worked as a course writer, administrator, and director of Vineyard Bible Institute, where she helped develop a correspondence program for leaders in Vineyard churches around the world. While auditing a leadership course at Fuller in 1991, the Lord spoke to Glanville about being “a leader, not just the wife of a leader.” At that time she completed her MA and PhD with a focus on leadership development, specifically for women. Glanville has presented papers on women in leadership for a number of conferences, including the conference of the Evangelical Theological Society (ETS) in 2007. She presented her paper “Breaking the Dividing Walls” at the International Association of Mission Studies (IAMS) Conference in Malaysia in 2004 and, in 2008, presented a paper “Missiological Reflections on Difference: With Reference to the Gospel of Luke and Jonathan Sacks” for IAMS in Hungary. Further, she published “Missiological Reflections on Difference: Foundations in the Gospel of Luke” in Mission Studies (2009). Glanville has written over 25 courses for Vineyard Bible Institute and two courses for Fuller’s Individualized Distance Learning program. Additionally, she is involved in the Christians for Biblical Equality organization on the local and national levels and the LA Maritime Topsail Youth Program, which uses sail training to equip youth with teamwork and life skills. Glanville is also a lay leader in her local church. Currently she is teaching modules for the Doctorate of Missiology program on leadership, research design, and qualitative methodology, as well as mentoring a number of doctoral students.